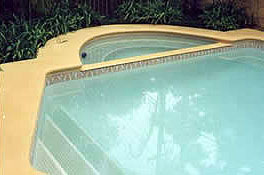 For some pools, especially if in high water table , or structurally weaker, or there is no hydrostatic valve, bracing is desirable to prevent collapse. This can also be a good idea if pool at bottom of dip, or if any rain water may run underground to wash away fill behind walls. Here is what some pool owners have done as a way to reduce risk. Naturally it will be necessary to remove bracing to clean paint areas covered by bracing boards or panels. Think about the process before emptying your pool. The easiest to undertake is probably the one with the horizontal plank just before the top. The surface can be prepared while partly full, then brace and empty. 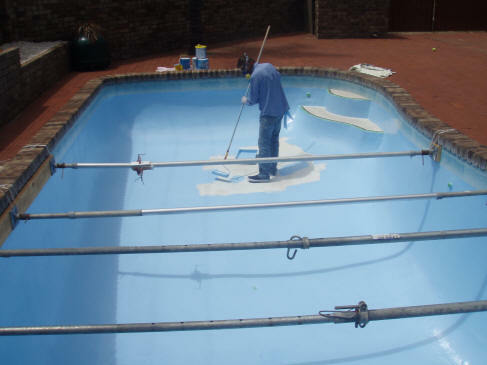 Carry out all preparations and painting work then partly fill pool, remove bracing and finish off 150 mm band that was covered by blank.